Asus today announced RP-AC68U, its top-of-the-range 802.11ac (AC1900) dual-band Wi-Fi repeater. The compact and stylish RP-AC68U features four internal high-performance antennas (3 transmit, 4 receive) and allows users to easily extend coverage of an existing 802.11ac Wi-Fi network with ultra-fast speeds of up to 1900Mbps. 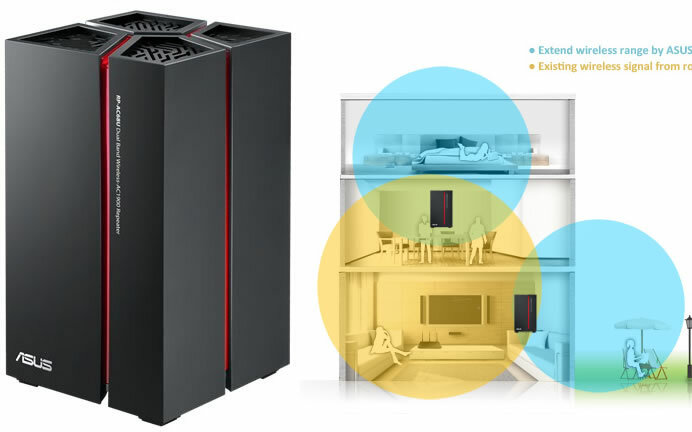 The compact RP-AC68U has a sophisticated and stylish design, with illuminated red accents that can be turned on or off by a convenient touch sensor incorporated in the Asus logo on the front. 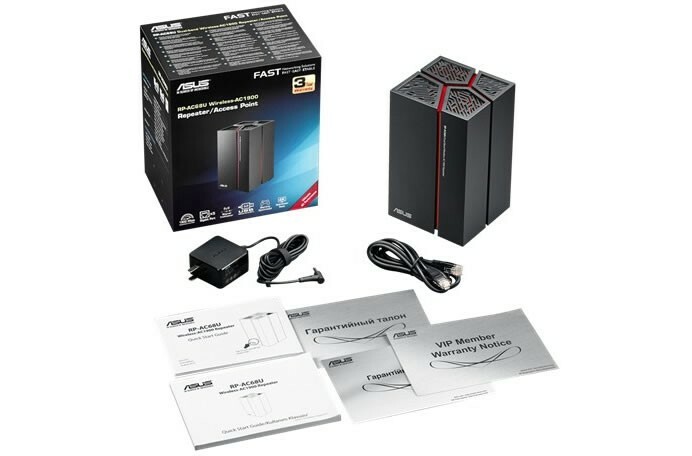 Asus RP-AC68U works by connecting wirelessly to an existing router and extending the Wi-Fi signal to areas of poor coverage, which are often a problem in large or multi-floor homes. With its blindingly-fast up to 1900Mbps combined speeds (600Mbps on the 2.4GHz band and 1300Mbps on the 5GHz band), RP-AC68U is the perfect companion for extending the coverage of the latest 802.11ac routers, but it can also be used with routers supporting any older Wi-Fi standards. For the best results, RP-AC68U needs to be located in a position where there is a sufficiently-strong signal from the router. 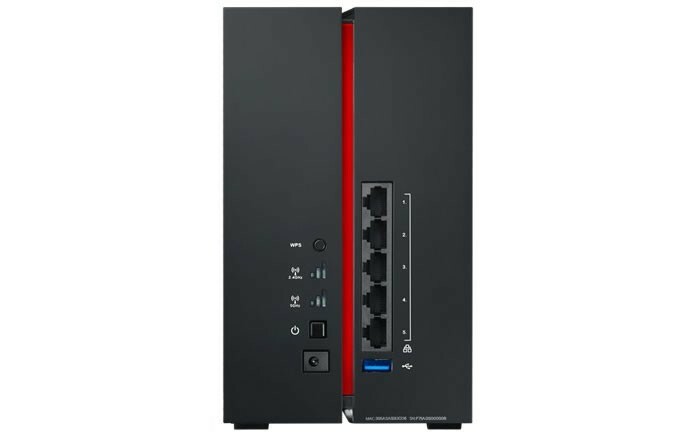 With five Gigabit Ethernet ports for connecting wired devices, RP-AC68U gives users the performance and flexibility to configure their home network to suit any situation. With RP-AC68U, users now have the freedom to connect all their wired devices — including game consoles, PCs, smart TVs, printers, NAS devices and much more — and make RP-AC68U the powerful heart of their home media and gaming network. Perfect installation is made foolproof thanks to RP-AC68U’s dedicated LED signal strength indicators for each frequency band, which help the user find the best location for RP-AC68U. RP-AC68U is perfect for extending multi-device HD streaming, online gaming, and other bandwidth-intensive tasks to every corner of the home. RP-AC68U includes a USB 3.0 port that delivers up to 10-times (10X) faster data transfers than USB 2.0, ensuring fast and responsive performance for connected USB storage devices. Users can easily create their own personal cloud server by connecting USB storage and using the Asus AiCloud app to access and stream stored content anywhere.